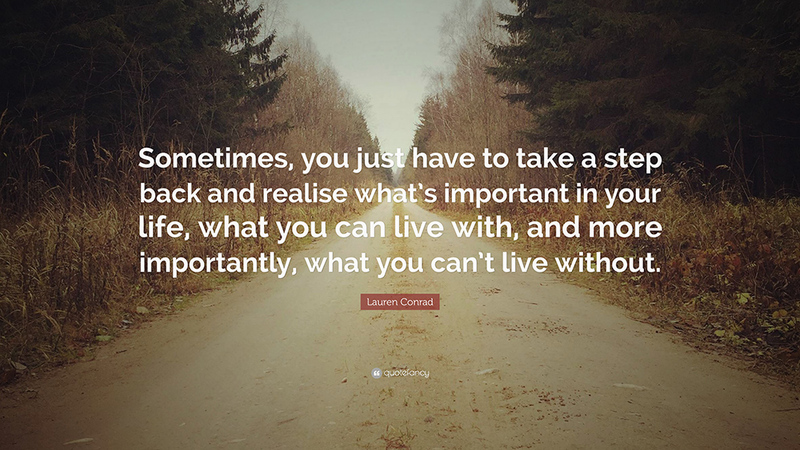 It's a little ironic that in our pursuit of happiness and all the good things in life for ourselves and loved ones, we tend to lose sight of the things that truly matter along the way. We think so much about the destination that we forget to admire the scenery along the journey. We hurry through our daily lives, stick to our routines and sometimes, everything becomes a frenzy that we wonder what we've achieved at the end of it. We think far ahead but fail to cherish the present, the today, the now. We forget that that each day is a gift, a gift for us to treasure, to laugh, to love, to live. The month of April has been an exciting, reflective and meaningful one for me. I turned a year older, I celebrated a decade of marriage and most importantly, I decided to stop in my tracks, take a look at things from a bigger perspective, think about the things I am doing too much/not enough of, and to remind myself of what truly matters to me in my life now. In this month's "Happiness is...", it's all about taking a step back in order to move forward. It's easy to forget but I tell myself that while my kids are still young, I wanna let them take priority over other things in my life. That includes blogging, scrolling through social media feeds, trying to read a novel I started on last year, Netflix, couple dates, couple holidays, and so on. That means nowadays, I try my best to not let myself be distracted by the phone or any other matter when I am around them. I want to be fully present, not just with my body but my soul and heart too, when they are beside me. To give them the full attention and undivided love they need, and deserve. We've been keeping up with our mum-and-kids date nights since the hubby works late nearly every weekday. We watch movies, we visit playgrounds, we go for ice cream treats, we have Sunday breakfast at McDonalds when the hubby is out playing football, and we just enjoy each other's company - provided they are being cooperative and not throwing tantrums or fighting when we are out. Lol. It won't be long before they start wanting to hang out with friends more than mums, right? I've also been yearning to take them on one-on-one dates and have been thinking of the things I can do with each of them, based on their interests and loves in life (which can be quite different). It's going to be hard because I will need the hubby to look after the other two (good luck, dear!) but let's hope that we can try it out soon. Weekends, as always, are very precious for us because it is the time when we get together as a family. I have been nagging at the hubby to put away his phone more because the kids don't get much time to interact with him all week so they have been asking me why Daddy has to work such long hours and why does he still use his phone on weekends on they are around him. Oh well, it's gotten us into arguments but I guess he will see things from our perspective somehow. It's also a reminder that work should never take importance over family and no matter how bogged down he gets at work (I can tell he suffers from high levels of stress daily), it shouldn't affect the relationship with the kids. Likewise for me, chores are my 'work' and part of my daily life as a SAHM, they are never ending, they are tedious and they wear me out. But it should never seem like these so-called tasks are more crucial than me being with the kids. You know what I mean? 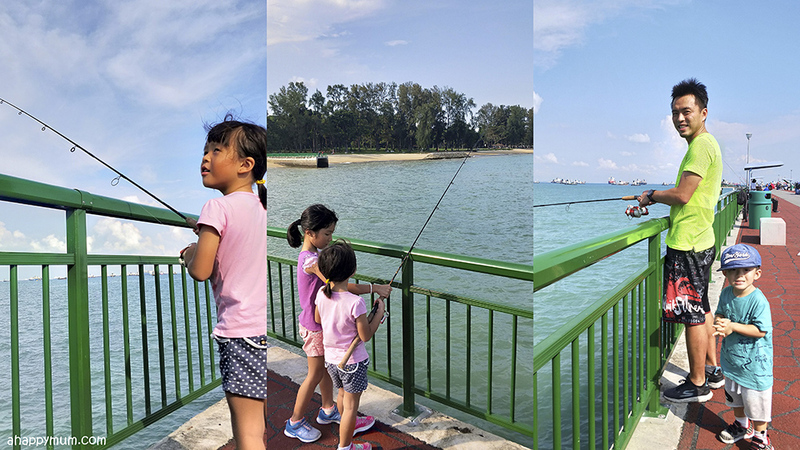 I am relieved that we still make time to go outdoors and we had a good Sunday at East Coast Park eating at the food centre, fishing at Bedok Jetty and going on a one-hour ride on the family bike where we just pedaled, pretended we were on a roller coaster ride and sang our hearts out to familiar pop song tunes. That was definitely a moment when we took a step back from the hustle and bustle of life, together as a family. Talking about taking a step back, it's always awesome to go on a family staycation in Singapore and we haven't done that for a long time. Thanks to kind folks at Shangri-La, we were granted a weekend stay on my actual birthday and the kids had the chance to play at the new Buds playground (read my review here). I can't say I totally rested during that trip because truth be told, any blog collaboration means that I am always running around with my camera in hand, trying my best to capture every moment be it in pictures or on video clips. The worse thing is since I'm not a very good photographer, I try my best to take as many pictures as I can just so I have a huge selection to choose from. Yup, I went home with hundreds of photos and dozens of clips so I could work on that one review post. Not easy as it looks, yeah? Birthdays, in recent years, are celebrated with the kids, the hubby and my parents. I guess they are the ones closest to me and it's nice to just know that they look forward to celebrating this day with me. The kids give me the sweetest cards and I always look forward to seeing what they will draw for me. For now, they always love to draw our happy family, which I hope means a lot because it shows that they are happy to have me as their mum, just like how I know I am blessed to call them my own too. 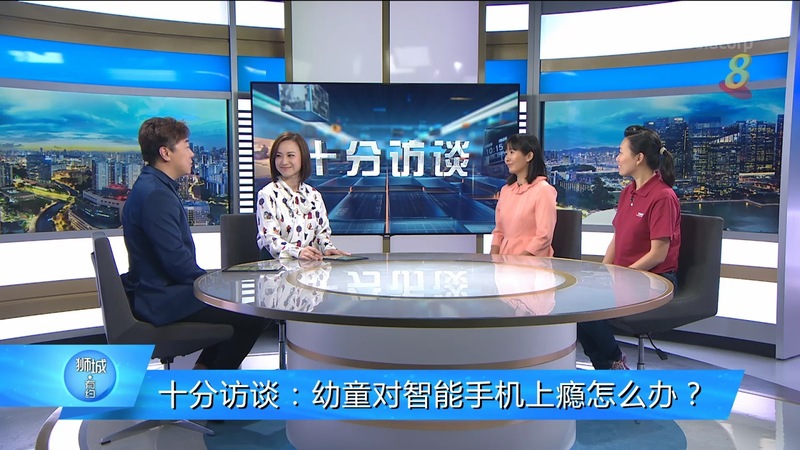 It's been a while since I went on a live interview but given how this topic of kids being addicted to smartphones is one close to my heart, I decided to take it on when the editor at "狮城有约 Hello Singapore" rang me up. I've rejected a few requests in the past few years because I didn't feel strongly about the topics and it's hard for me to get a babysitter or get the hubby to take leave last minute. This time round, the good folks at MediaCorp offered to help me keep an eye on the kids in the waiting room while I was in the recording studio, which would take around 40minutes at most. I really wanted to share my views in this matter and in my heart, I knew this was an opportunity that would not come by easily again. 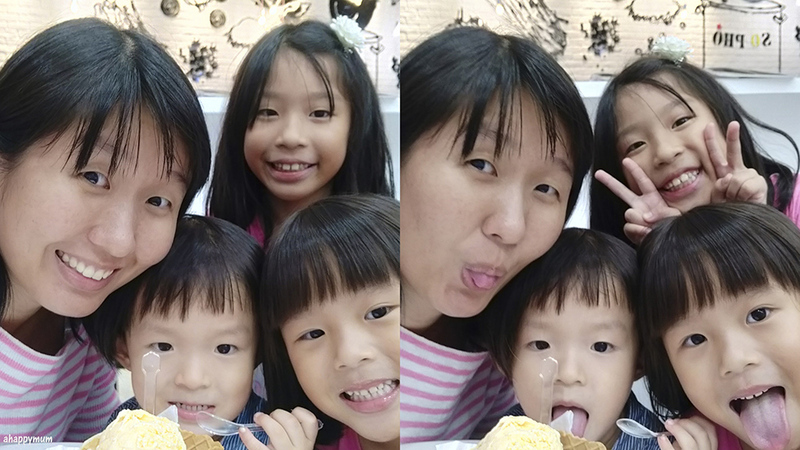 Therefore, armed with the big sister's homework for the day, as well as biscuits and candy as distractions for the younger ones, the four of us made our way to the new MediaCorp campus all the way across the island. You can watch a recap of the interview conducted in Chinese at https://bit.ly/2Ha90AY. In the home, I've been trying to cut down a little on the chores that I have to get through each day and besides closing one eye to dusty floors and messy rooms, another way is for me to outsource them to the kids. Haha. Yup, the 5-year-old was excited to help me prepare our meals and that she got to handle a sharp knife and peeler for the first time. I do think these are important life skills which they pick up in the process and these should matter more than getting full marks in spelling tests, shouldn't they? We also went to carnivals and had fun at the game stalls, for instance the girls were so thrilled to go into a big bubble in the water and laughed non-stop as they rolled around, the toddler went into a bouncy castle and was the gentlest jumper there, he then played a game of fishing and caught the biggest prize which was a Nemo stuffed toy, and we also tried our luck at this Thunderbolt game which has 36 squares and using 18 tiles of your choice, you have to form at least one straight line (be it horizontal or vertical). It wasn't really about winning for me, it was about playing and having fun together as a family, and making all these priceless memories with my kids during their growing up years. You probably can also sense that I'm taking a step back when it comes to blogging, even though I know that I won't be able to give it up because writing all my heartfelt stories is a way to keep me sane, to remember and be able to get through those trying moments and to connect with so many of you like-minded mums out there. So, I guess my posts might not come as regularly as before but they will still keep coming whenever I get inspired (and find pockets of time to be able to sit in front of my computer), yeah? That said, I've taken on another role and that is as a committee member in the Parents Volunteer group in the big girl's new primary school. I was already active in her previous school but this time round, I decided to just roll with it and might as well join the committee. Haha, as if I am not busy enough with three kids and blog, right? I guess I just need a change in lifestyle and a challenge for myself too. Anyway, that means I now need to go for regular meetings with the Principal, Vice Principal, Teachers in charge and fellow members (and I have to bring along a 2yo to the meeting, which I'm very thankful that they allow me to). Real adult interaction for the first time in a long time. Haha. I even had to do a Powerpoint presentation for Teacher's Day because I'm in charge of coming up with gifts for a total of 150 staff. That saw me running around to places like Art Friend and Popular in Bras Basah, Spotlight in Plaza Singapura and a few other places for inspiration - which the kids always saw as an adventure since I have to lug them with me, even on weekday nights. We have this huge family event coming up soon and as the props I/C, I've been spending my weekday mornings at her school just doing lots of cutting, pasting, sticking, and coming up with all kinds of props needed for the actual day. It is tiring yet fulfilling to be part of a team of committed parents who have the heart to serve (not in order to get our kids into the school because all our kids are already in lor) and I've been inspired by them to put in my best effort for these events. Yup, so Asher goes with me every day and it's nice to see him interacting with other adults and their kids too (who always come and look for us at recess time and they will play with him). The biggest reward is knowing that the firstborn is proud to see Mama putting in so much effort for her school and there is this sense of indescribable joy that we both feel and I think it's something that will bond us too. Last but not least, the hubby and I celebrated our 10th year of wedding anniversary in April 2018. It's a huge milestone, isn't it? We went for the earliest showing of Avengers at the movie theatres (at 820am!) after dropping the girls in school and getting the in-laws to look after Asher, then made it back in time to pick Ariel before noon. At night, we went for a nice dinner at House of Crab, who so happened to be celebrating their 10th anniversary too and there was a special promotion ongoing - 2 crabs for just $52!! It was a yummy dinner filled with lots of love - and noise - because the kids were all with us. But, I guess that was the best way to celebrate our special day. The kids and I went to IKEA to get this surprise magnetic board for the hubby and we printed some of our photos onto magnetic paper from Canon too. Each of them also drew a little something on shrinky dink paper which we turned into magnets too. It would probably be a lie to say that I wasn't at all sad to know that the hubby didn't get anything for me at all. It's not that I needed anything and I have told him before that flowers and lavish gifts are not my kind of thing, but I was still hoping for a handwritten card or just a little something for keepsake since we made it through a decade of love after all. I guess he got the hint so he did say he will make me a card, which might jolly well arrive a year later, but we'll see how that turns out. Haha. He did point to himself and said he is my best present which is annoying yet true. Yup, I guess as long as that we are together in love, willing and able to work through our differences hand in hand, that we never forget why we got married in the first place, that we both have a desire to keep this family happy and closely-knitted, that we remind ourselves just how rare true love is in this world, that is more than what I can ask for. Till more thoughts on happiness next month! It is a beautiful complete and really good regarding daily life. Looking great together & Happy family!